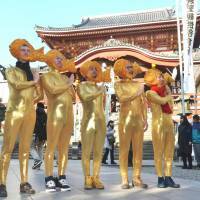 Men wearing gold, full-body suits and costume hats, themed as taiyaki (a waffle-like cake shaped like a fish, typically filled with red bean paste), have started to appear in central Nagoya, attracting the attention of pedestrians. The men call themselves the Shachihoko Boys — a reference to a golden imaginary creature with the head of a tiger and the body of a fish, which can be found on the roof of Nagoya Castle. Last year they released a debut CD. They’re ambitious, and are looking to break into the global market. But what exactly do they hope to achieve by strutting around Nagoya in such eye-catching costumes? 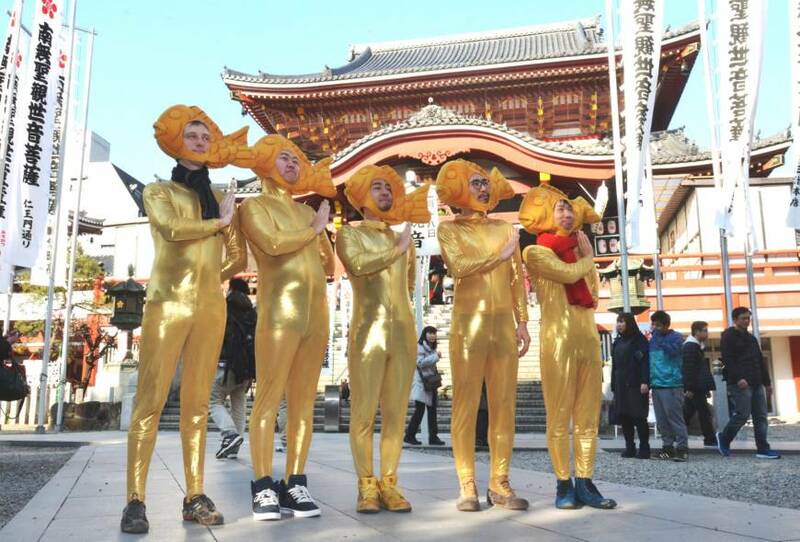 During a recent public holiday, 32-year-old Motoki Ikeda, who runs a restaurant, and four of his friends — all wearing the gold body suits — strode through the gate of Osu Kannon. The temple was packed with visitors, who immediately turned to the five men. One of them asked, “Are you supposed to be taiyaki?” When they replied that they are the Shachihoko Boys, they were welcomed enthusiastically by those who understood the cultural reference. “I wanted to stand out,” recalled Ikeda. He wore the suit as a joke to a friend’s party, but it turned out to be a huge success. After that, he began hitting the streets while wearing the outfit with friends, including 35-year-old designer Tetsuya Ishikawa. The reaction they got was better than expected; people came up to them to take photos or ask them what they were doing. At first, Ikeda only invited people he knew, but once they had more than five, the group began to grow on its own with others seeking to join. To become a member, all they have to do is prepare the costume themselves. The group grew so big that even Ikeda does not know how many people are in it now. Their main activity is walking around the city once a month. Members say they like the “out-of-ordinary experience” of having attention lavished on them, and they stopped feeling embarrassed after the first time. The group is so unique that an acquaintance asked them to appear on a live show, which then led to them appearing on a commercial for AOKI’s Pizza in 2016. Last year they released their first CD featuring a song they had made, called “Sekai Kiseki.” Currently, they are making appearances on self-sponsored radio and online shows. “By walking around the city (in these costumes), I can bring entertainment to people’s daily lives and make them smile. I hope to make Nagoya a more lively place,” said Ikeda. In February, a member from France, 31-year-old Jeanpierre Etienne, returned to his country. Before leaving, he said to Ikeda, “Maybe I’ll try doing this in France too,” planting the idea of introducing the concept globally. “If we explain that the costume is Shachihoko from Nagoya Castle in Japan, maybe we can proudly present it as part of Cool Japan,” he said. To become a member, or for more information, visit the group’s website at shachihokoboys.com (only available in Japanese). This section, appearing Tuesdays, features topics and issues from the Chubu region covered by the Chunichi Shimbun. The original article was published on March 31.